First of all, I want to thank all of you for your well-wishes during my time of extreme craft craziness. To those who I met at the various fairs and shows, thank you so much for coming out and saying hello! But why we’re really here is for the food, and trust me, these tiny cakelets are worth the wait. To me, they taste similar to a hot cross bun but with a much more tender, soft crumb (and so much easier to make). Calling these warm, buttery bites cakes are a bit of a misnomer. While they’d be wonderful after dinner served with tea, they are also kissing cousins to a tender scone which makes them an ideal way to start the day. I’ve updated the traditional recipe which calls for currents and candied peel for dried cranberries and fresh orange zest. Using part whole wheat flour works well and still creates that soft-in-the-middle texture while upping the whole grain factor. While Welsh Cakes can be baked in a 350F oven, I do think that cooking them in a lightly buttered skillet is the way to go for something truly special. They are the perfect start to Christmas morning or any morning for that matter. elsewhere: In between craft fairs, I managed to write a few new posts. Check out my holiday gift guide and a recipe for colcannon with brussels sprouts over at Poppytalk. At ReadyMade I write about how to tame the crazies with a few simple meal tips. In a large bowl, blend together the flours, sugar, baking powder, salt and spices and fluff mixture with a fork. Add in the cubed butter and work in the butter with your hands into the flour mixture until the butter resembles oats. Add in cranberries and zest and stir in milk and beaten egg with a wooden spoon. When the dough starts to come together, knead a few times and dump onto a lightly floured surface. Pat down dough and roll out to about 1/4 inch thick. Cut out with a 2″ biscuit cutter. Roll out remaining dough scraps and repeat. Add butter to a large heavy skillet and heat over medium heat. 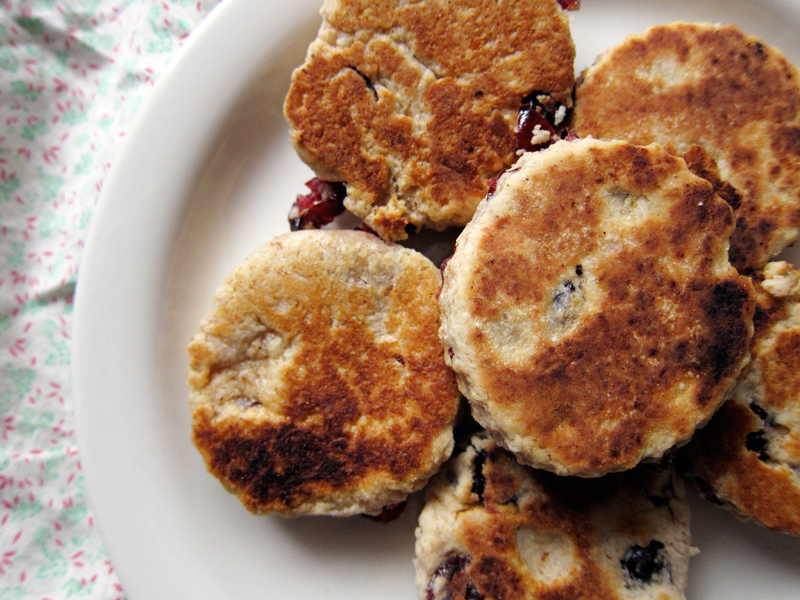 Add the welsh cakes to the pan, in batches, and brown each side for 4 minutes. They should be soft in the middle and nice and golden on the outside. Serve warm with coffee or tea. Makes 21 2″ cakes. These look so good! Perfect afternoon tea snack. Yum. I love the pretty edges from the scalloped biscuit cutter! I’d love to relax with one of these and a cup of tea right about now. wow. please send. i will pay. man those look so good. we need smellovision. These are beautiful! I have oranges waiting for some greatness here and these just may be it! Yum, I just made a batch of these the other day using my Welsh great grandma Jones’s recipe. Truly hard to beat! I will take anything carbalicious at this time of year! I bet these would make for an awesome breakfast treat! What you need to do is have these with some Caerphilly cheese. The pairing is sublime. It’s a typical Welsh way to eat them. Spread some butter on the cakes for more sinfulness. Wow I’m really surprised you know about Welsh cakes. Being from Wales they are a part of every bakery but theres something strange in seeing other countries with them. Wow, those look great. is the plate sitting on a vintage apron or something? It’s a beautifully soft pattern. Someone recently asked me about Christmas morning traditions at my house. I think they were secretly hoping I made something delicious like this and wanted the recipe. The truth is, growing up in a Jewish household, the Christmas morning thing is still new to me. But I can see starting a tradition with a delicious dish like this! Cooking them on the stove top sounds like a good idea. I’m glad I found this before Christmas, it is a perfect holiday treat! Thanks Tea! I couldn’t agree more. Nicole, I think the scalloped edges take it over the top. Thanks for noticing. Eva, I’m sure you’d love them. Enjoy! I’d love to see what you do with this recipe, Sarena! Jill, I’m sure my version can’t compare with your grandmother’s but I was pretty happy with the results. Wow, EmLue, so glad you tried these and loved them! Yes, I think just using your hands instead of re-rolling is a perfectly acceptable option. Thanks for stopping by, retro! Joanne, perfect for breakfast indeed. Catherine, never heard of that cheese. Will look, thanks! Yusecki, they aren’t common here but I did want to try them out. So glad I did! SixBalloons, you’ve got a great eye! Yes, it’s indeed a vintage apron (and one of my faves). Thanks Gordon – the spices worked really well here. Ha, yes, not going to work is one of the greatest holiday benefits, I think Bijoux! Have a great holiday and enjoy! Dana, discovering new traditions is also a good part of the holidays. Hope you have a great one! Great to hear it, Sam! Hooray! Suzy, it’s what I liked about these – a bit different. Maddie, they are perfect and would be just lovely with a spot of tea. Enjoy! Yum. These look lovely and I can’t wait to try them. Your knack for hitting a smell-memory-place-feeling-process-meditation, as well as good flavour, is unrivalled! 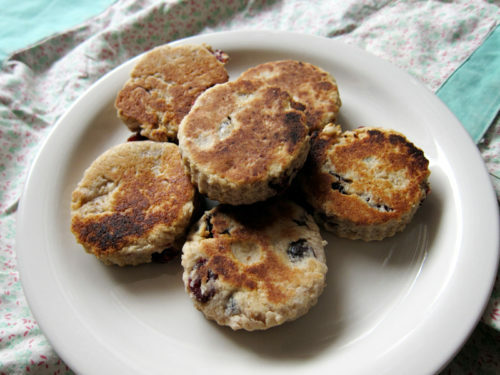 I always stick to the traditional recipe, which I gleaned from my Nain’s intergenerational cook-book (without candied peel, just currants) – always thought Welsh-cakes would make and INCREDIBLE ice-cream flavour! PS: thanks for introcducing me to proportion cooking. It’s so much easier to figure out the process when you’re dealing in cups. It’s taking some getting used to, but this will be my first ever non-metric Welshcake batch! (This is big stuff). Love Welsh Cakes! 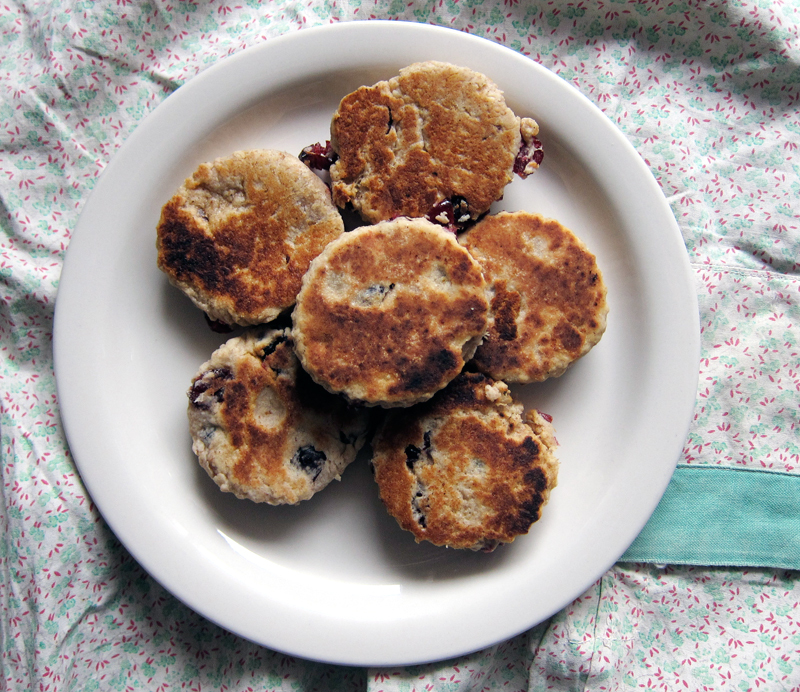 Try them with chocolate chips…or cut them in half with strawberry jam! Yum….lots of variations, anything you like…or just hot with sprinkled sugar on top for the purists.. thanks for this! Aw shucks, thanks so much Sara. I agree about Welsh cake ice cream. Yum! Thanks Joanne – I like mine just simple and plain (but not plain at the same time, if you know what I mean). I’ve never had or seen anything like this before but am completely in love with them!! I love that they’re cooked in a skillet. Think I could use all whole wheat pastry flour? Victoria, yes, I think it should work out fine. Let me know how it goes.